Doug Pederson looks on at Eagles practice to see if his trappers are trapping. Over the last three seasons under Chip Kelly, the Eagles had difficult training camps, employing perhaps the fastest paced practices in the NFL. Players received maximum reps, but little in the way of in-practice instruction. On the bright side (for the players, anyway), the Eagles did not tackle in practice. Under Doug Pederson, Eagles training camp will do a compete 180. 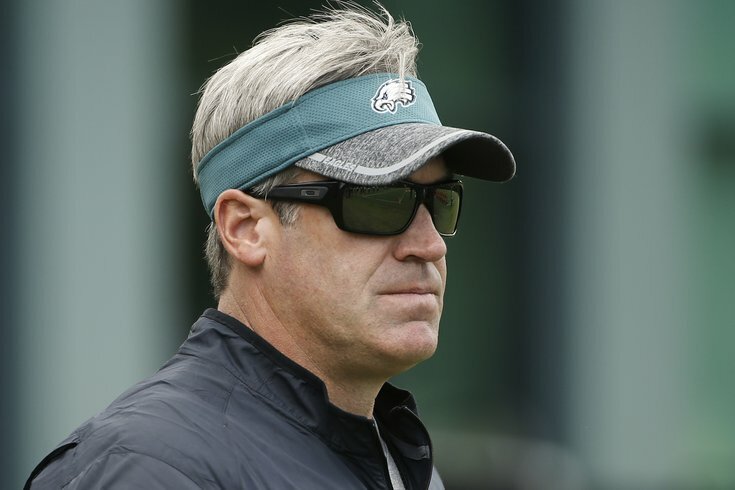 Pederson's practices will be slower, but the Eagles will wear full pads approximately three out of every four days. And yes, there will be tackling. Some of Pederson's padded practices will be "thud" days, in which linemen will hit (up high only -- no cut blocks), but defenders will not tackle. Other days, they'll be "live," or full-on tackling, with the quarterbacks excluded. Pederson spoke passionately about hitting in practice. "Why I do I believe in hitting? And I'm a former quarterback... It's a physical game; it's football. It's tackle football," he said. "I think the only way you can properly fit offensively and defensively, you have to put the pads on and you have to hit. I'm not saying you have to go live every period -- you don't have to. But to run around in shoulder pads and pants in the heat -- it's gonna be hot in September, it's gonna be hot in October. "From your offensive and defensive lines, this is where games are won and lost. You've heard about that -- games are won in the trenches. Those guys have to know how to hit. We can zone block all you want in shells, but we're also gonna trap, we're gonna power, we're gonna gap, we're gonna counter. Puller's gotta hit, trapper's gotta trap, and it's a physical game. That timing has to be done in pads, and quarterbacks need to throw in pads. They need to feel that pocket when bullets are kind of flying around them during training camp. That's all a part of the process in getting your guys prepared for the regular season." Trappers gotta trap indeed, Doug. When asked if practicing in pads is the best way to evaluate players, Pederson continued. "From a physical standpoint? Yeah," said Pederson. "For instance, if you're looking for a fullback, you gonna go out here in shells and tell me you're going to find a fullback? I want to see him run downhill and hit a MIKE linebacker. I want to see him strike a defensive end. I want to see if he can hold up. Do his legs collapse? Does he stay up? Can he power through the block? I want to see if guards can pull. I want to see if linebackers can tackle. I want to see receivers and DBs test each other, and the only way you can do that is in pads. We can put the shells on all day, and you still have to learn how to practice out of pads and protect each other that way. But the best evaluator in this game, I feel, is in pads." There are two schools of thought on physical practices. On the one hand, Kelly had a tremendous record in terms of players staying healthy. Certainly, tackling during practices increases the odds that players will get hurt. On the other hand, as Pederson notes, tackling most effectively simulates game situations and provides the most accurate measure of player evaluation. Also, it's fun to watch.